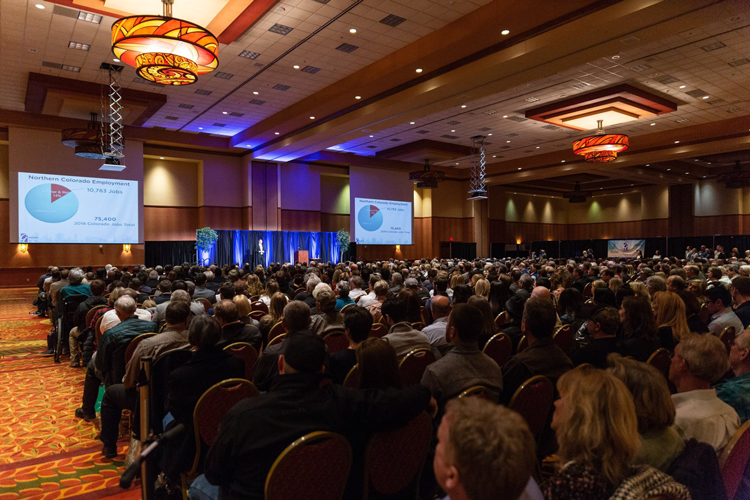 On January 23rd, we held our annual Real Estate Forecast for about 1000 attendees. Through presentations from our President Brandon Wells and other local experts, we examined the trends and statistics behind the 2018 housing market and made predictions for the coming year. And because the housing market is driven by much more than sales prices, we also explored job growth, population statistics, transportation projects, developments and more. In the past, our forecasts have been between 95 and 99% accurate. And as we looked at the numbers from 2018, we stuck to that pattern. We showed 95.27% accuracy for Northern Colorado home sales and a whopping 99.28% accuracy for average sales price. Want to find out what those numbers tell us about Northern Colorado? Keep reading. If you’ve lived in Northern Colorado within the past decade, you’ve likely noticed the boom in both population and job growth. These numbers consistently cause our communities to be ranked amongst the most popular places to move in the state which drives the housing market, the local economy and so much more. In 2018, Larimer and Weld Counties were home to 14% of Colorado’s jobs. And at the same time, Larimer County added 5,226 residents between 2017 and 2018. Weld County added 9,925. While discussing these job statistics, we also looked at the Bloomberg Brain Concentration Index which tracks business formation as well as employment and education in the sciences, technology, engineering and mathematics. In 2018, Fort Collins was ranked second on the list just behind Boulder—and that’s on a ranking that compiles data from cities all over the United States! Our hometown jumped up from fourth place in 2017. You can see the Bloomberg Brain Concentration Index here. And how has that affected the housing market? Since 2013, the Fort Collins and Loveland areas have seen only appreciation in average home sale prices, and those percentages have consistently been 7.5% or higher. In 2018, we saw an 8.1% increase. And you’ll find a similar pattern in Greeley where we saw an 8.6% increase last year. As those values have appreciated, we’ve also seen an increase in the supply of homes across the region, especially as new construction facilitates development and higher populations in our smaller communities. In 2018, total listings in Northern Colorado topped 13,000 for the first time at 13,005. With our decades of experience in real estate, specifically the unique market here in Northern Colorado, we compare the numbers, look at upcoming projects and developments, and compile predictions for the coming year. As we mentioned, these predictions are consistently 95% accurate or better. And in 2019, we’re not expecting to see a dramatic change in recent patterns. As appreciation and growth continue, they won’t increase quite as dramatically as they have in the past. Looking at average sales prices, we’re predicting a 5% increase in Fort Collins, a 3% increase in Loveland, a 6% increase in the Greeley and Evans area, a 2% increase in Windsor and Severance, a 1% increase in Timnath, a 6% increase in Wellington, and a 5% increase in the area that consists of Ault, Eaton, Johnstown, Kersey, LaSalle, Mead and Milliken. For Berthoud, we’re predicting only a slight increase from $448,314 in 2018 to $450,000 in 2019. 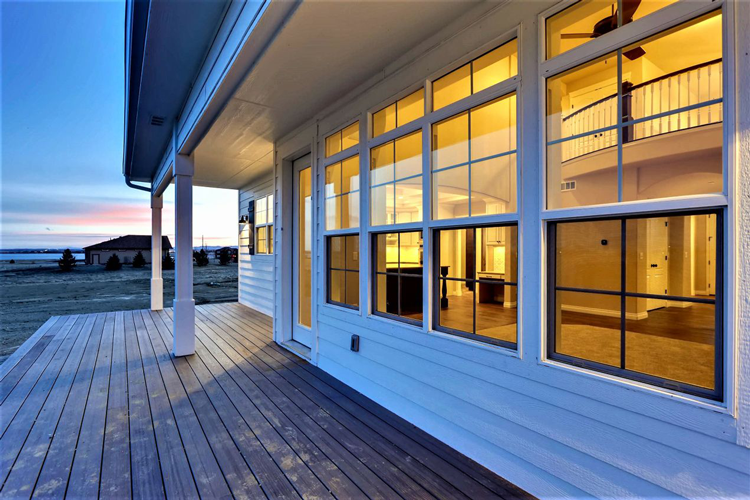 Following these patterns, we’re predicting a slight increase in total Northern Colorado home sales from 10,605 homes to 10,680 homes in 2019. And we expect to see an increase in average sales price for the region from $388,200 to $410,492. One of the tools we use to understand the local housing market is The Boulder Benchmark. 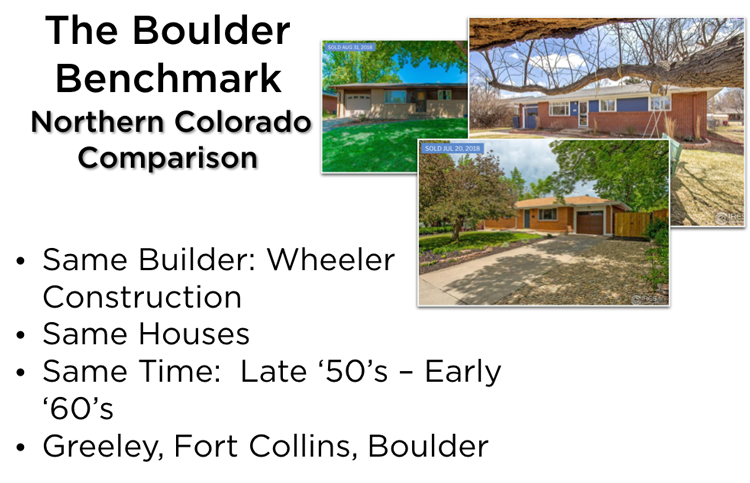 This comparison examines three homes: one in Boulder, one in Greeley and one in Fort Collins. Carefully selected, each home was built by the same builder around the same time, has the same number of beds and baths with comparable square footage, and was sold in 2018. For this year’s Benchmark, we looked at three homes built by Wheeler Construction in the late 50s and early 60s. Predictably, the 1,040-square-foot home in Boulder sold at the most expensive price: $700,000. This puts it at $673 per square foot. Next up, was the home in Fort Collins. At 1204 square feet, it sold for $437,500 or $363 per square foot. And the most affordable home was sold in Greeley. At 1,026-square-feet, the home sold for $270,000 or $263 per square foot. As you can see in the graph above, this pattern has remained consistent since 2010. 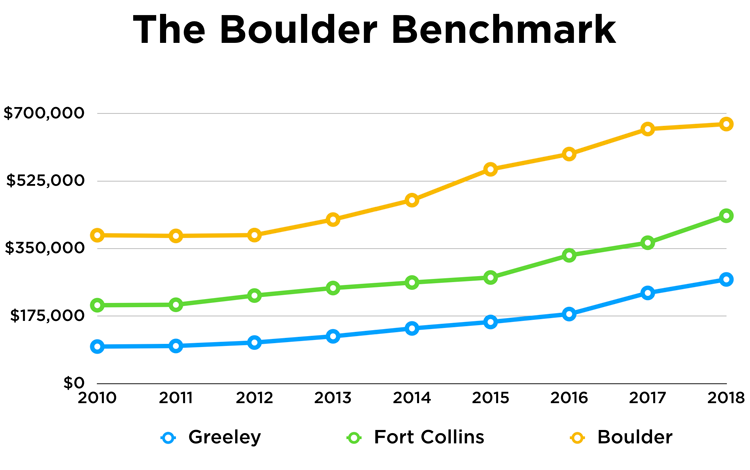 As home values increase across the Front Range, Fort Collins and Greeley have always been the more affordable communities in The Boulder Benchmark. So, when we compare job growth, population growth and quality of life (like we did with the Bloomberg Brain Concentration Index above), we see Fort Collins, Greeley and our other Northern Colorado communities ranked as some of the most affordable and best places to live in the state and the country. In fact, WalletHub ranked Greeley, Longmont and Fort Collins on their 2018 ranking of the Best & Worst Cities for First-Time Home Buyers. And all were ranked in the top 25! At the same time, Realtor.com found Greeley-area homeowners who bought a home in the first half of 2017 turned an average profit of 10.3% one year later. Longmont owners averaged 13.5% while Fort Collins and Loveland owners could expect 6.3% or 7.3% profit respectively. You can find links to presentations, reports and more information presented at our Annual Forecast here. To search homes available in Northern Colorado right now, you can use several search options on thegroupinc.com, including our Advanced Search and Map Search.